Scranton and NYC-based REV Theatre Company aims to present Shakespeare and other classical works in innovative ways, often based on workshop approaches. The company seeks to build new communities along the East coast. After a run in Cape May, NJ, REV is bringing Shakespeare’s THE COMEDY OF ERRORS to Columbus Square Park in South Philly at the end of this month. In this, the second of a two-part interview, we talk to REV founders Rudy Caparoso and Rosemary Hay about the company, its performance venues, and the upcoming production. Read the first part. [Columbus Square Park, 12th and Wharton streets] July 30-31, 2015; revtheatercompany.org. Henrik Eger: REV stands out by performing in public spaces like parking lots, storefronts, piers, the steps of the Philadelphia Museum of Art—even cemeteries—and now Columbus Square Park, a Philly ball park, with THE COMEDY OF ERRORS. Tell us more about the audiences that you attract. Philadelphia (on the steps of the Art Museum): While we were in Philly, about 10–12 young African-American kids started to watch rehearsals and then came back to all of the performances. They didn’t sit on the grass; they actually sat on the steps at the back of the Museum, so close to the actors that they were almost in the production. After our last show was done, they all came back to see the performers and begged Rudy for his feathered wings he wore as Puck. The young woman who took them said that she would put them on her wall and keep them forever. New York: After our initial run of The Witch of Edmonton in a tiny storefront on the lower East Side, someone who saw the production underwrote the transfer of the show to a theatre in Times Square for a three-week run. Stamford, CT: Unexpected rain stopped the performance of Midsummer Night’s Dream ten minutes before the end. Actors voted to continue with the show if the audience was willing as well. It was put to an audience vote, and the audience of over 100 voted to stay. Of their own collective volition, they went to the parking lot, got their cars, drove to the site and circled the actors with their high beams on, to cut through the rain and the darkness. Eger: Now you are even staging Shakespeare’s THE COMEDY OF ERRORS at a former ball field in Philly. Hay: True, REV’s production is spilling out into the audience and all around the space, making it as interactive as possible. For our upcoming Philadelphia production: actors bring up spectators to dance with the cast during the final curtain call song so audience members can join our dance party! Rudy Caporaso: Overall, our target audiences are families with children, senior citizens, Shakespeare lovers, and young people. Hay: The production is funny, zany, and madcap—an homage to 1930s screwball comedy, with its elements of slapstick and vaudeville. It’s exuberant and mega-energetic, physical to the point of athletic. The break between the first and second acts is filled with Rudy and three female cast members singing “Too Fat Polka” from 1947. We also include a 1970s disco song “Ain’t Gonna Bump”—all in reference to the Nell character. We believe that these elements make our production unique and compelling and different from other productions. Eger: “REV Theatre Company’s aim is to revitalize and transform the great classic plays.” Tell us more about the history of REV. Does the name imply that you are “revising” classic plays, or that you are “revving up” part of our cultural heritage? Hay: The name stands for “revolution,” “revitalize,” and “revamp.” All those words imply we are taking a classic text and putting our stamp on it, without discarding the language or story. Caporaso: Not to lambast anyone else’s work, but we made the decision not to do “museum-quality” theater. Hay: With my classical background, I work with the actors to mine the text for what it can give us. For example, our productions include 1960s pop songs like “Little Red Riding Hood” for the entrance of the Devil Dog in The Witch of Edmonton,and “Makin’ Whoopee” in A Midsummer Night’s Dream as Titania and Oberon reconcile. And because the world we create is so particular, these musical choices never seem out of place. Eger: You’re not only performing in many different locations—from South Jersey to upstate New York—but also for different audiences, ranging from traditional school performances to the avant-garde among theater-goers who might even crawl to see your experimental shows at a cemetery. Given this wide range, how does REV build a loyal audience? Hay: The audiences are very different, but they are committed and supportive in the different communities. And there is potential crossover; for instance, our audiences for our Fringe show, The Graveyard Cabaret, will be invited to see our production of THE COMEDY OF ERRORS, and many of them have already said they will attend. Caporaso: There’s cross-pollination overall. However, with our Graveyard Cabaret, now in its fourth year on the Philly Fringe, I’m happy to say that it has attracted its own “cult” following. People look forward to it and return to the historic Laurel Hill Cemetery in Philadelphia. Eger: Lest anyone mistakes REV as a travelling circus that puts on slapstick Shakespeare, you do serious work, even adapting rarely performed Elizabethan plays. What is the driving force for you to experiment with many different forms of presenting Shakespeare and other classical dramas? Hay: In Shakespeare’s time, theater-going was an event. It was a mixture of a rock concert and a sports game—raucous, intense, and very immediate. Actors had to command attention from their audiences. In the 21st century, we need to find new ways to get people to come to a theatrical event or performance. We can’t rely on traditional modes of sitting quietly in a theater and watching from a distance. We need to immerse audiences, surprise them, shake them up, challenge their thinking, and engage both their hearts and minds. Caporaso: I have absolutely no problem being considered a “circus.” I’d much prefer that label, rather than being associated with any “highfalutin” and/or elitist work. It’s important for us to return Shakespeare to the people. Eger: In Philadelphia, REV was recently chosen to become the resident company for the Friends of Columbus Square Park, helping to turn the ball field into a community space. 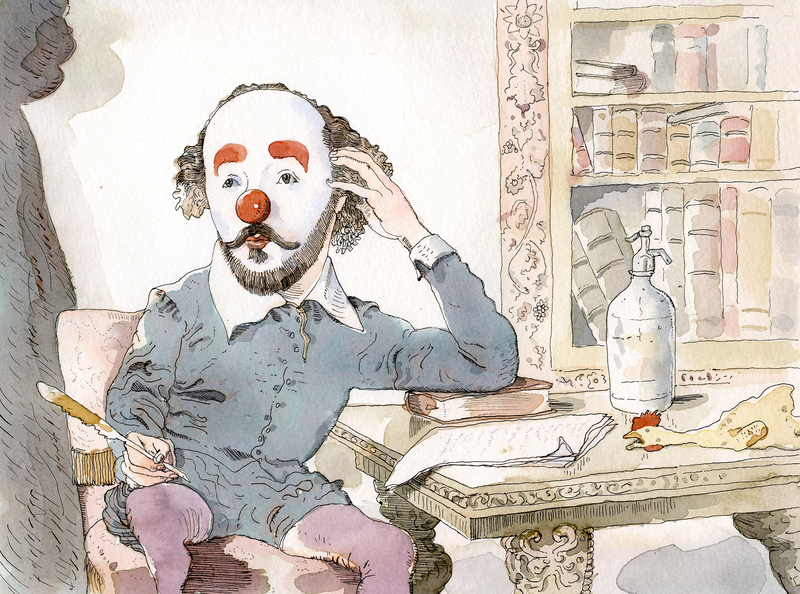 Was there any resistance to such a dramatic change: from baseball to Shakespeare? Hay: There was no resistance. Everyone is thrilled that there will be theater and arts performances in the park. The renovated park will include open space for the community, as well as playing fields. THE COMEDY OF ERRORS will be presented in Columbus Square Park later this month. Caporaso: We’ve become great friends with Ilene Wilder, President of the Columbus Square Park Advisory Council, and the Park’s “force for change.” She saw a REV production of A Midsummer Night’s Dream a couple of years ago and has been a great supporter of our work since. She is dedicated to her Park mission, has seen our work more than once, and is committed to having REV in the Park as part of her vision. Eger: A creative production of Shakespeare at a baseball field? With great actors? With music? With lots of surprises? And all of it free of charge? Who can resist such a COMEDY OF ERRORS? See you, not at the Globe in London, but at the ball field in Philadelphia—with all the other groundlings on their blankets and chairs. William would love it, no doubt. REV Classical Theatre Company’s production of THE COMEDY OF ERRORS plays at or before 6 PM on Thursday and Friday, July 30-31, 2015, at Columbus Square Park. FREE show. 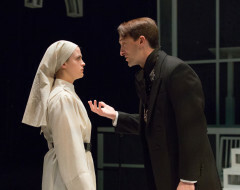 revtheatercompany.org.